Chesterfield’s famous Whit Walks are believed to be the largest in the country. The Procession of over 25 churches of all denominations includes decorated floats and tableaux, marching bands, giveaways from balloons to bibles, clowns and the latest Christian music. 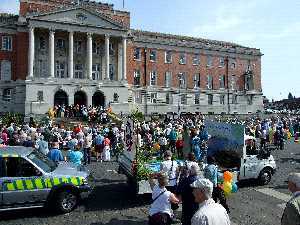 Once the procession has left the Town Hall, it follows a route into town along Knifesmithgate, Cavendish Street, Newbold Road, Queen Street, Tennyson Avenue, Rose Hill West and back to Town Hall. There will be entertainment from Crackpot Theatre Workshop, more band music and refreshments both outside and in Eastwood Memorial Hall on Rose Hill. All are very much welcome and encouraged to attend.